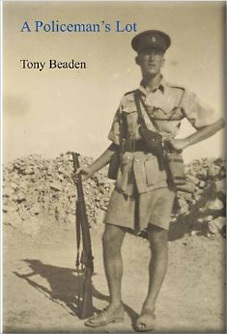 Tony Beaden begins his memoir of colonial life with his childhood, his schooling during the war and his time in the RAF. These recollections really start with his change of career by joining the Hastings Borough Police. Three years later he tried to join the Malayan Police and shortly aften/vards was successful in joining the Uganda Police. His first posting, after Police Training School, was to Moroto in Karamoja, a District on the Kenya border populated by cattle people with a penchant for cattle theft. The heart of his book was his time in Karamoja when, as a young man, he had all the excitement that he could have wished for. As he admitted "My life in primitive conditions of Karamoja had become totally fulfilling". In a very detailed account he described pay safaris to remote police posts, a secondment to Turkana in Kenya in support of the Kenya Police who were organising Jomo Kenyatta's detention centre, shooting for the pot to supplement the diet of Police in the Turkana forts. It was an ideal life for a determined young policeman. One's first posting is often special in one's memory and I get the Impression that this was so in Beaden's case. Service in Karamoja was interrupted by six weeks as the Governor's protection officer at the time when the Kabaka of Buganda was being deported. His opinion of Sir Andrew Cohen was not high. A return to Karamoja was followed by leave in the UK and a posting to Katwe in Buganda. Beaden was then sent as the Senior Police Officer to Soroti in Teso, the next-door district to Karamoja. I was a young District Officer in Soroti and remember many of the stories, even if from a different angle sometimes. Beaden does not spare people who earned his strong disapproval. In Soroti's case his second In command. He was exasperated by his casual approach to work, especially his failure to keep the Police records in good order even to the extent of leaving a body in the evidence store from a case investigated a year before. After posting to Masaka in Buganda which included an earthquake when he was knocked out trying to rescue someone Injured, Beaden was posted to the Police Training School. He retired in 1965 with the rank of Senior Superintendent of Police and Commandant of the Police Training School though he did a stint as Acting Assistant Commissioner of Police when he was Director of Training. At this time he commanded the Annual Police Review. Independence followed and many African officers were promoted. At this time his practical expertise was noted when he refurbished the Police Coat of Arms at the Police Training School. This resulted in his being requested to manufacture Uganda Coats of Arms which were used in courts and Government offices. This is not just the recollections of a Colonial Police Officer but the progress of a young determined man in a career that undoubtedly suited him. As he says, it was his children who wanted his recollections so it begins as a "family" piece, especially in his early life, and the Karamoja account has the appearance of an expanded diary with its wealth of detail. So essentially this is an account for his family and It would have benefited from an index and chapter headings. It is not a description of the position of the Police in a colonial territory, though it would have been interesting to have had Beaden's comments, other than by Implication, on the broader scene of the Uganda Police in the moments before and immediately after Independence.